All these teams brought the city together as Chicago became a renowned sports city with an international flair. But that’s not the only thing Chicago has to offer. With growing leagues of expatriates mingling with native Chicagoans on the streets, European sports are gaining increasing popularity, especially in the past 10 years, bringing people from all nationalities to secluded bars priding themselves in offering unique experiences for expats and locals alike. But what does it mean? Why should we care? And where should we go? It’s 8:45 a.m. on Saturday and the city is slowly awakening after the polar vortex forced everyone into hibernation. The Graystone Tavern, 3441 N Sheffield Ave. in Lakeview, is slowly filling up with people covered in blue from head to toe. The crowd gathers near the multiple screens placed all around the establishment, beer in hand, ready to cheer. 9 a.m. The whistle blows, and the nearly 20 customers start clapping. Soccer has been an integral part of Roberts’ life. She was born in England, but also lived in Germany, two countries where “Football” is king. In Europe, American football and baseball do not dictate one’s Sunday – soccer does. It took time for Americans to buy into the sport, and there are strides left to be made, but bars like The Graystone Tavern are helping with the transition. Chelsea is one of the best teams in the Premier League, the main soccer league in England. The Blues are currently 6th behind their biggest rival Arsenal. The rivalry may be more intense in London, but everything about the soccer culture gets represented in this Lakeview bar as this soccer fever expands throughout the city and the country. Leonard thinks that the length of a soccer game may be helpful in the growth of the sport in the U.S. A regular game is 90 minutes, while most American sports span at least two hours to complete a game. But most importantly, there are no interruptions, no timeouts, no commercials in a soccer game except for halftime. Soccer is not only great for expats such as Oswald, Leonard, or Roberts, it’s great for business. Stone’s interest in the sport grew because of the Chelsea fans who are regulars at his bar, and he mentioned that watching games used to be more difficult for Americans in the past. Stone said that Graystone uses three streaming services including ESPN Plus, Bleacher Report, and NBC Gold which he estimates cost about $30 each per month. Less than a mile away, a different crowd is roaring, this time sporting green and white at Paddy Long’s, 1028 W. Diversey Pkwy. The six [VI] nation rugby tournament kicked off this past weekend, including a premium matchup between two Top 5 teams in the world, England and Ireland on Saturday at 11 a.m.
All chairs are filled 30 minutes prior to kickoff, while the smell of bacon and beer fill the place up. Unlike soccer, rugby’s popularity varies greatly in international circles. Western Europe, New Zealand, Australia and South Africa are known as rugby areas. However, the sport is still struggling to make its way into America. But sometimes, all it takes is one rugby game to turn things around. What started as a small venue intensified quickly as the bar is now packed with rugby supporters yelling at the TV screens for different reasons. Like Graystone, Paddy Long’s welcomes a lot of expatriates, and according to Dan Anderson and Padraic Connolly, co-founders of a youth rugby team, the ratio is evening up with Americans feeling more attracted to the game than ever before. Anderson, a Chicago native, started getting involved with rugby six years ago, while his Irish friend Connolly grew up with the game. According to an ESPN article, 35,000 U.S. high schoolers are playing rugby, 10 times more than a decade ago. Anderson explained that he saw that respect when visiting Ireland and attending a game there. The respect between the teams and the fans pushed him to get involved in the sport. While the sport is growing in the country, the broadcasting regulations are not as simple as Stone mentioned for his business. Paddy Long’s charges a $20 cover per person, which was not their idea, Burger said. According to Burger, the streaming company called Premium Sports charges him a significant amount of money that’s hard to recover from even with the sales made when the bar opens early. Burger does not mind. He started this bar because of his love of the game. He explained that he only obtained the rights to stream the VI nation tournament last year, but he plans on broadcasting it as long as he can. Burger did comply with the streaming fee, though that did not prevent a server freeze for 10 minutes, leading to complaints and chatter across the bar. One group did not let this technical difficulty bother them as a member pulled up the game on his phone, attracting curious heads from the tables nearby. Sports unite people one way or another. Whether it is cheering for the same club, for the same country, or hating the same team, and even liking the same player, the moral remains the same: Sports create connections. 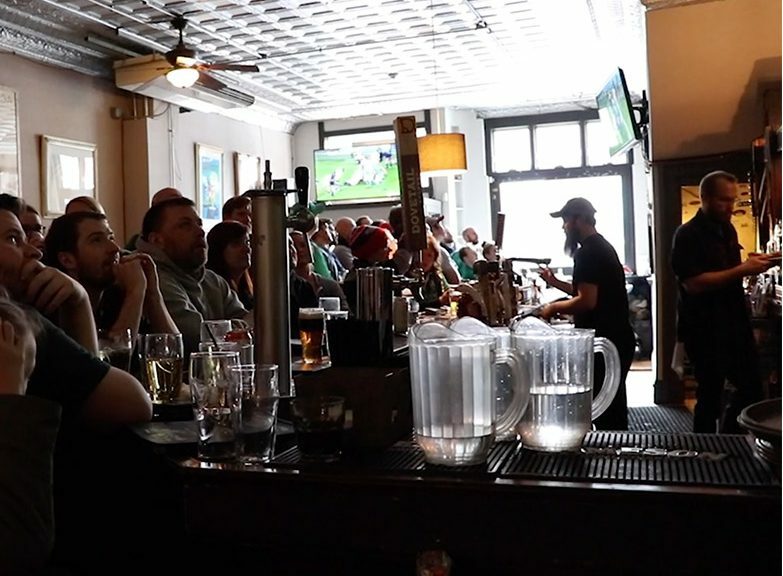 What Chicago bars such as Paddy Long’s and Graystone offer a broader connection as expats and locals come together to learn from one another and share their cultural knowledge to spread the love of the sport they follow.